Congrats to Capt. 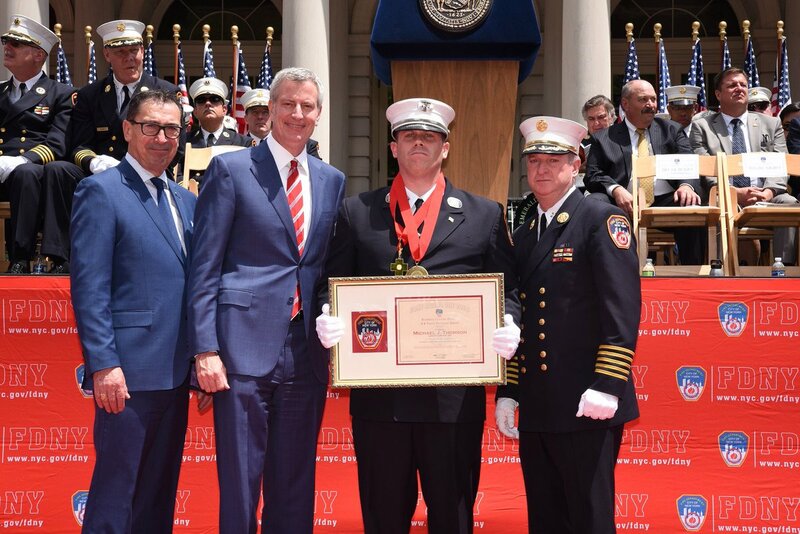 Mike Thomson for receiving the 2018 FDNY Brooklyn Citizens award for actions at box 77-1675 at address 260 Stone Ave. Captain Thomson reacted decisively and showed steadfast leadership under extreme conditions. Captain Thomson acted selflessly and under the greatest traditions of Watkins Street and the FDNY. At 0835 hours, TL120 was heading north on Mother Gaston Blvd. at Belmont Ave., returning to quarters from another run. In the distance, a column of smoke could be seen rising over the Howard Houses. At the same time, Brooklyn Box 1675 was being transmitted by the Brooklyn dispatch office, reporting smoke at 260 Mother Gaston Blvd. Box 1675 was a first due box for TL120. TL120 was assigned to the box and was a 10-84 in a matter of seconds. Upon arrival, fire could be seen venting from the top floor of the address. Captain Michael Thomson of TL120 transmitted a 10-75 for a top floor fire in a 13 story class 1 fireproof multiple dwelling. The fire was in apartment 13A, a large 3 bedroom apartment. The members of TL120 exited the fire truck and did a quick size-up. 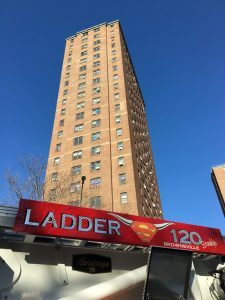 The members quickly noticed multiple persons trapped behind child gates in the fire apartment, with heavy smoke pushing from each window of the apartment, Captain Thomson instructed TL120’s Chauffeur, Firefighter Brian Cross, to assist with operations on the top floor. Captain Thomson, Firefighter Cross along with Forcible Entry Firefighter Michael Meyer, Can Man Firefighter Steven Hay, Outside Vent man Firefighter Daniel Monteleone, and Roof Man Firefighter James Giammalvo proceeded to the 11th floor via the “A” elevator. Captain Thomson instructed Firefighter Monteleone to assist with operations in the fire apartment due to the numerous people confirmed trapped. TL120 ascended the “A” stairwell to the 13th Floor and found Apartment 13A. Screams could be heard coming from the apartment. With face pieces donned, the inside team began to force entry into the apartment; the door began to warp due to the intense heat. Upon entry, the members of TL120 were met with extreme heat, fire and zero visibility at the front door. Captain Thomson told Firefighter Hay to hold back some of the fire with the extinguisher while the members entered into the apartment. The OVM remained at the entry door. Captain Thompson and Firefighter Meyer entered the living room where Captain Thomson came across 21-year-old Angel Ortiz. A 10-45 was transmitted and Captain Thomson and Firefighter Meyer together removed Mr. Ortiz under the fire and out into the “A” Stairwell. They re-entered the fire apartment and continued the right-hand search as Firefighter Hey continued to hold back the growing fire with his can. Firefighter Meyer found a second 10-45, 46-year-old Raphael Espinal who was lying prone on the floor. Another 10-45 was transmitted and then began to remove the victim to safety. This proved to be difficult due to the large size of the victim and numerous obstacles in the apartment. With the assistance of the OVM, they were able to remove Mr. Espinal to the public hallway and to the waiting arms of another unit. Command informed Captain Thomson that victims could still be seen at the window; with conditions rapidly deteriorating, they returned to the fire apartment. At this time, TL120’s Chauffeur, Firefighter Cross, along with Engine 231, made their way to the 13th floor. Firefighter Cross along with Lieutenant Salvatore Mirra, found their way to the apartment door through the black acrid smoke. When they opened the door, heavy fire began venting from the top of the door. Cross entered the apartment under the fire where he met up with the OVM who directed him to the location of Firefighter Hey. Firefighter Cross brought a Second extinguisher and gave it to Firefighter Hey, Firefighter Cross then began his right-hand search of the living space. Considerable time had passed and without the protection of a handline, it was likely that TL120 would get cut off by fire. Captain Thomson returned to seat of the fire where Firefighter Hey informed him that the second extinguisher was running low. Just then, Engine 231 could be heard moving the handline into position. Captain Thomson teamed up with Firefighter Cross to continue his search. Firefighter Meyer had located a bedroom door and immediately found unconscious one-year-old baby boy (Ivan Paez) and two females just inside the bedroom, 20-year-old Morline Perez and 17-year-old Brandy Paez. Firefighter Meyer transmitted a 10-45 for the victims and his location. Firefighter Meyer began to remove the baby from the bedroom. Firefighter Meyer informed Firefighter Cross of the two remaining victims in the room. Firefighter Meyer removed the baby to safety while Firefighter Cross entered the bedroom for removal of the remaining two females. Upon entering the bedroom, Firefighter Cross closed the bedroom door only to discover an unconscious 8-year-old boy (Brandon Paez) on the floor. Firefighter Cross transmitted the 10-45 and requested Firefighter Monteleone to assist him in the removal. The two females were conscious and at the windows. Roof Man Firefighter Giammalvo lowered his mask down to Firefighter Cross so as to shelter the females in place with air while he and the OVM removed the 8-year-old to safety. As they exited the bedroom, information about the females was passed along to Rescue 2 after which the two were removed to safety. Captain Thomson has again made his way into the apartment and entered the left rear apartment to find yet another unconscious female, 40-year-old Alexandra Mello. He transmitted the 10-45 and began removal of Mrs. Mello from the bedroom. The Captain and Firefighter Meyer were assisted by a member from Rescue 2. Captain Thomson, Firefighter Brian Cross and Firefighter Meyer are being honored for their rescues, but could not have happened without the teamwork of all the members of TL120. Their selflessness in the face of extreme dangers exemplify the traditions and commitment of all members of the FDNY.